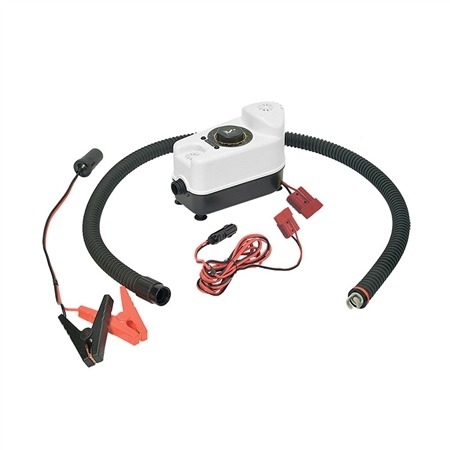 The Bravo GE BP12 is a lightweight 12 V inflator suitable for Inflatables with High-Pressure Air Deck Floors & RIBs up to 3 metres. It has a maximum pressure of 14.5 psi with a piston flow rate of 160 l/min & a consumption of 13 amp max. It has an automatic stop when the selected pressure is reached and is equipped with an adaptor set for most common valves on the market today. It is supplied with a shoulder bag and 1.70 m tube and 3 m power cord which now incorporates a cigarette lighter adaptor. This pump can be used to inflate and deflate. The inflation time is 6-10 minutes. 21cm x 11cm x 13cm.